Looking for a Choice at Town Meeting? Although Mr. Grant’s observation is correct that the town residents were given but one budget option to either approve or disapprove, I submit that the floor of the town meeting is not the place to write a $52 million budget. What is missing from Mr. Grant’s essay is the fact that the School Committee, the Select Board, and the Finance Committee jointly developed the proposed budget over a period of nearly six months – during which time there were numerous opportunities for public input. By the time of the Town Meeting, residents should expect the budget to be finalized and presented for approval by the residents of the town. The complexity of the budget, and the requirement that it be balanced, is such that its development by 11,000 town voters, or even 150 town meeting attendees is not practical. The budget is appropriately, in my opinion, prepared by the three committees that are charged with representing the town residents. The members of these committees take into account the needs of the town as well as input from residents. They assure that legal constraints (mandated programs) are financed, and that other statutory requirements are met (such as having a balance between income and expenses). Those developing the budget to explain what they did and how they made the choices that were made. Options that were considered and rejected could be presented, but a review of six months of budget development would are not needed. Nothing would be served by rehashing at the town meeting each controversy or compromise that took place during the preparation of the budget. The Town Manager’s presentation met these objectives. Individuals to ask questions regarding the budget process, the bases for decisions that were made, and the budget recommendations. Individuals and groups with alternate positions on budget items (income or expenditures) to communicate their position and seek support from the town voters acting as the legislative branch of our government. Alternative proposals for additional spending should include either equivalent spending reductions in other line items or a source of income to support the added line expense. Even with the prior development of the budget, residents still have the option of rejecting the budget on the floor of the town meeting – although I would submit that such action should be accompanied by a clear directive of how the proposed budget should be revised. Mr. Grant acknowledged that the operating budget presented at this year’s Town Meeting “looked like a reasonable product of tough times and hard choice”. However, I could not disagree more strongly to his other comment that “the 150 residents who attended should be under no illusion that they wielded any significant power at that meeting.” Those 150 people did far more than pass a budget that that had been written, debated, and rewritten over a period of six months; they acted on 33 other articles on the Warrant, several of which had not been subject to that same level of public review over the prior several months. It is most interesting to note, that indeed, many of the articles and motions that failed to gain residents’ support at the town meeting were those that had not been broadly considered prior to the meeting. The issue that appeared to be of greatest interest to Mr. Grant (and perhaps to those who were in attendance) was the issue of postponing the vote on the budget. Although the tri-committees (School, Select Board, Finance) had met the evening before the town meeting to discuss this issue, the short notice prior to that meeting and technical difficulties at LCTV (which prevented it from being televised) essentially made this a “new” issue to most of the electorate when it was proposed on the floor of the meeting. As a new issue, the debate was lively and polarized. I would guess that opinions were voiced at the Town Meeting that had not been heard the evening before. With the State Aid budget still not in place two weeks after the town meeting, it appears that the decision reached by the town’s electorate prevented an unnecessary delay in the approval of the budget that was developed over months of effort. 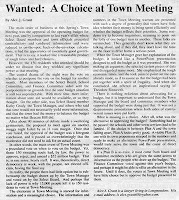 Other articles that seemed perfunctory when posted (such as articles 13 for remote reading water meters, articles 16 and 18 on parking and snow removal and article 32 on outdoor water use) also failed when questions arose on the floor of the town meeting that might have been addressed or at least anticipated had these items been given the same opportunity for prior public review. Yes, Mr. Grant, only 150 people participated in this year’s town meeting, but whether in the vote on postponement of the budget or any of the 34 scheduled Warrant Articles, these people had significant power – and hopefully next year will see ten times as many voters at the Longmeadow Town Meeting to show the power of the people. Mark Gold is the chairman of the Capital Planning Committee and is a candidate for the one year seat on the Select Board. See his website at GoldforSelectBoard.com for additional information.